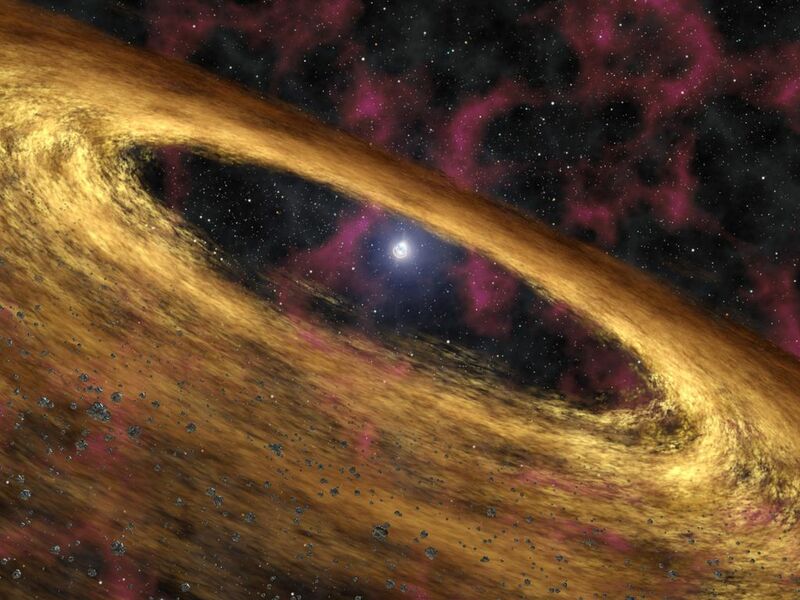 This artist's concept depicts a type of dead star called a pulsar and the surrounding disk of rubble discovered by NASA's Spitzer Space Telescope. The pulsar, called 4U 0142+61, was once a massive star until about 100,000 years ago when it blew up in a supernova explosion and scattered dusty debris into space. Some of that debris was captured into what astronomers refer to as a "fallback disk," now circling the remaining stellar core, or pulsar. 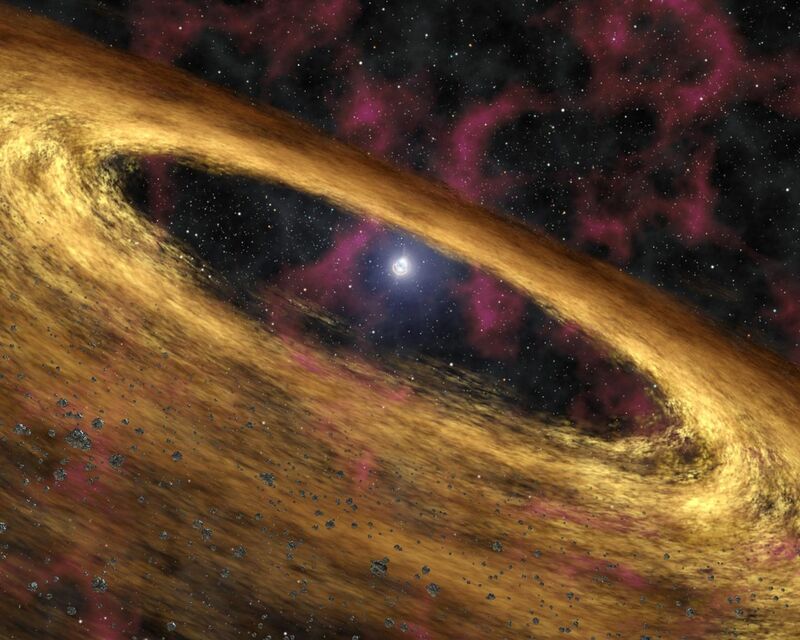 The disk resembles protoplanetary disks around young stars, out of which planets are thought to be born. Supernovas are a source of iron, nitrogen and other "heavy metals" in the universe. They spray these elements out into space, where they eventually come together in clouds that give rise to new stars and planets. The Spitzer finding demonstrates that supernovas might also contribute heavy metals to their own planets, a possibility that was first suggested when astronomers discovered planets circling a pulsar called PSR B1257+12 in 1992. This artist's animation depicts the explosive death of a massive star, followed by the creation of a disk made up of the star's ashes. NASA's Spitzer Space Telescope was able to see the warm glow of such a dusty disk using its heat-seeking infrared vision. 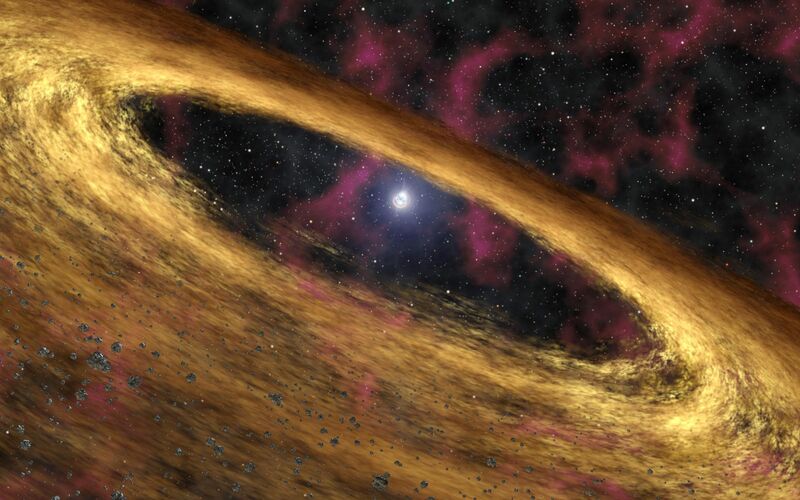 Astronomers believe planets might form in this dead star's disk, like the mythical Phoenix rising up out of the ashes. The movie begins by showing a dying massive star called a red giant. This bloated star is about 15 times more massive than our sun, and approximately 40 times bigger in diameter. When the star runs out of nuclear fuel, it collapses and ultimately blows apart in what is called a supernova. A lone planet around the star is shown being incinerated by the fiery blast. Astronomers do not know if stars of this heft host planets, but if they do, the planets would probably be destroyed when the stars explode. All that remains of the dead star is its shrunken corpse, called a neutron star. Neutron stars are incredibly dense, with masses nearly one-and-one-half times that of our sun squeezed into bodies roughly 10 miles wide (16 kilometers). They are so dense that their gravity causes light to bend and warp around them. The particular neutron star depicted here, called a pulsar, spins and pulses with X-ray radiation. Some debris, or ashes, from the supernova can be seen settling into a disk in orbit around the pulsar. This material never reached the velocity needed to escape the gravity of the pulsar, and can be thought of as falling back toward the star. 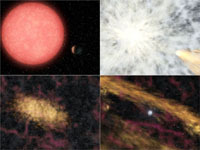 The resulting "fallback disk" resembles protoplanetary disks around young stars, out of which planets are thought to form. The pulsar observed by Spitzer, called 4U 0142+61, is13,000 light-years away in the northern constellation Cassiopeia. Its disk orbits about 1 million miles (1.6 million kilometers) away from it, and probably contains about 10 Earth-masses of material -- only a few millionths of the mass of the material expelled in the supernova. At the end of the movie, small asteroids begin to form within the disk. This first step towards planet formation might be happening in this system already.